Even BUSY, BUSY, BUSY people can volunteer! Don’t put off helping someone else — and YOURSELF – any longer! For more information call 274-8526 today or fill out this online Volunteer Information Request Form. Volunteer Opportunity Information Sessions and Tutor Training Workshops can be found on the LVORC Event Calendar. One-on-one and small group tutoring for Basic Literacy and English Language Learners: 2 hours a week after 12 hours of training (on-line training is available). Workplace Literacy: Teach a class at a work site utilizing vocabulary and materials used on the job to help workers improve their ability to speak English —2 hours a week after training. English Literacy Civics: Teach a class to help English Language Learners improve their ability to speak English and learn about life in America—3 hours/week after training. Financial Literacy: Teach a class at the YWCA or tutor an individual in money management—2-hour occasional class or 1 hour/week with an individual after 1 hour volunteer information session. Math Tutoring: 1-2 hours a week after 1 hour volunteer information session. High School Equivalency Preparation: Help someone prepare for the test -2 hours per week after 1-hour volunteer information session and 12-hour training. Everybody WINS! 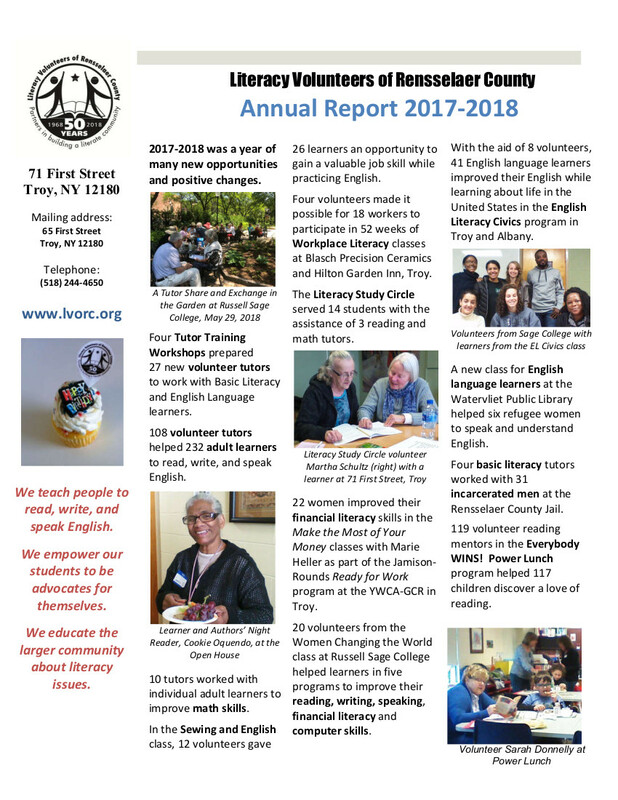 Power Lunch: Volunteers from local businesses and individuals throughout the Capital Region read each week during lunch break at a nearby elementary school to students who are below reading level – 30 to 40 minutes a week after 1-hour Orientation. Telephone Conversation Partners: Volunteers converse with intermediate level English Language Learners to help them expand their vocabulary and give them practice speaking/comprehending English over the telephone—-20-40 minutes each week after a 1-hour Orientation. Tutoring at the Rensselaer County Jail: One-to-one tutors give incarcerated men a chance to get individualized reading and math help while enrolled in Questar III classes at the jail. Office help, working at events, etc…if you have the time we have the need!